Clifden is a bustling hamlet in very West of Ireland in County Galway. After driving 80km from Galway City though the mountainous terrain when you land in Clifden you know you are far away from any urban area! This old traditional small town has lots to offer the visitor. After all, Clifden is famous for its friendly locals and lively atmosphere both during the day and the night. The night life is great here. Clifden has many award winning restaurants and almost every pub has live traditional music most evening so it is easy to relax and hear local musicians. Clifden has grown to include hotels but does not have any metropolis feeling about it. Clifden attracts many weekend visitors from England as Knock airport is nearby. Fresh seafood is served in most restaurants and pubs at a reasonable priced and sourced locally. In the past decade the quality of the food in this area has risen and a good point to remember when visiting Clifden. During the day there is so much to do if you enjoy the outdoors. Clifden’s main attraction is the walking and touring during the many hills and beaches the day. It is nestled on the edge of the Atlantic in Connemara and makes it an ideal place for exploring the countryside. This part of the West of Ireland is strewn with wild beautiful beaches nestled in the strangest of enclaves. What is magnificent about this area is that the water is bumped up on the landscape and is rugged and beautiful at every turn. A favorite of many is Dogs Beach with clear waters and regal mountains in the distance. Hiking the nearby mountains or walking the beaches attracts many here. Fishing is also a popular activity and a license can be rented for the day in one of the many fishing shops. 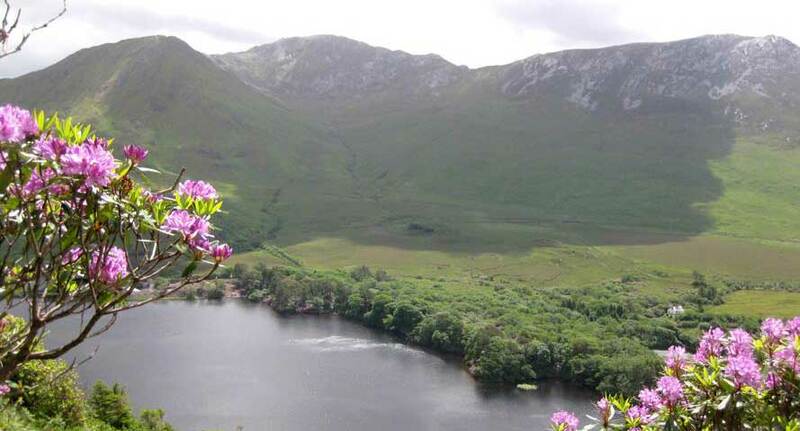 Connemara National Park is a short, 15 minute drive from Clifden and offers many levels of hiking from the beginner to advanced. Connemara offers the visitor the varieties of flora and fauna only found in Connemara. Near Clifden is Renvyle golf course, perfect for a change of pace. After a long day on the links or on the beach you can avail of their indoor swimming pool! Renvyle House also boasts an award winning restaurant with gorgeous views of the Atlantic Ocean, it is really magnificent. There is also a beach on its doorstep so it has a lot to offer. A worthwhile day trip is a visit to the fishing village of Roundstone. It is really charming and postcard picture perfect at every turn. You almost feel like you are on the set of a movie it is so surreal and peaceful. The scenery is breathtaking at every step in and around Clifden and makes this a must visit destination in the west of Ireland. Clifden houses a surprising number of galleries who host both local and international artists. The area itself attracts top artist and sculptors who have set up studios in this western enclave. Many of the artists are producing modern and fresh work exclusively for galleries in Clifden. A rainy afternoon can be spent soaking up the many galleries art works ranging from prints to fine oils and is a perfect alternative to the outdoors if it is raining as can happen in this part of Ireland.